When considering the must-have features for a blog, magazine, or business WordPress site, what do you generally have on your list? I would be surprised if your list didn’t include a social sharing tool, considering user sharing through places like Facebook, Pinterest and Twitter is essential for accumulating more revenue, drawing customers to your site, and ensuring your business stays connected with customers. Seeing as how hundreds of social sharing plugins exist all over the internet, developers don’t have the easiest task when whittling down the prospects. Therefore, we completed the work for you, giving a full examination of each WordPress social sharing plugin, and outlining some of the main advantages of each one. My experience with the UX. The website speed after installing each social sharing plugin. Over the years I’ve noticed that some social plugins are known to significantly slow down websites. Therefore, I’ll use Pingdom and GTmetrix to check out site speeds after the plugins are installed. Upon landing on the Monarch dashboard, I noticed that the tools were consolidated well, and you receive quite a few social sharing animations and buttons. In terms of the UX, Monarch is the best you can find. I can’t imagine a beginner getting too confused about this. For example, you receive a few social sharing configurations, including sidebars, inlines, pop-ups, fly-ins and social buttons on media. Overall, five locations exist for placing your buttons. The social following tools speed up your development as well, since it minimizes the need for other plugins. You get to choose from the social network buttons, of which there are 20. Some of the other settings include social network names and follower counts on the buttons, colors, responsiveness and speed optimization. Besides choosing the networks you desire, most of the default settings don’t need to be changed. How Does This Social Sharing Plugin Affect Site Speed? After installing the Monarch plugin, no changes occurred to the site speeds. However, as one might assume, throwing in a few slide-ins and social buttons would be bound to slow it down a bit. The score changes aren’t terrible, but you should be aware of them. Social Warfare is pretty much useless without the premium version. If you install the free version and go to the dashboard, you’ll find access to a handful of sharing buttons, and no other features. However, upon activating the premium plan, things change. 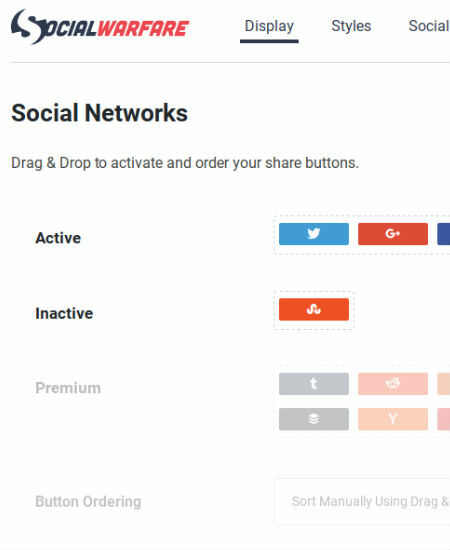 For example, you get access to about 15 social sharing buttons. 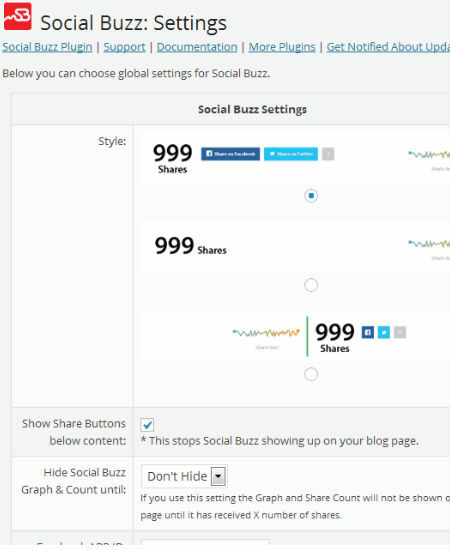 The buttons are visually displayed on the dashboard, and share counts are optional. The plugin provides settings for positioning your sharing buttons on blog posts and pages, and there’s even a tool for placing a Pinterest hover button on top of images. The primary tabs are called Styles, Social Identity and Advanced, all of which are pretty standard. My favorite setting provides a click to tweet button on certain lines of text in your blog posts. The score that changed the most was the Pingdom performance grade. Quite a bit actually. 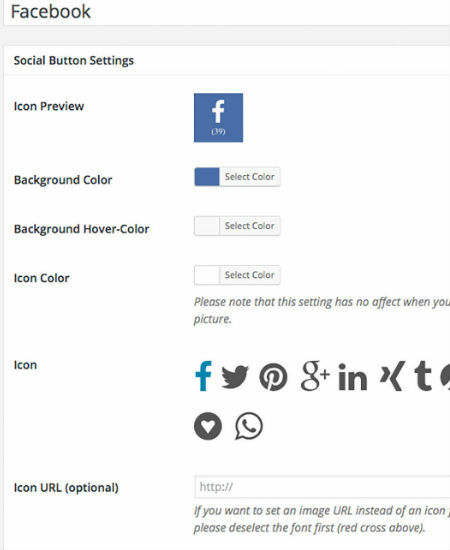 With 25 social buttons and 22 fan counters, the options with the Ultimate Social plugin do not disappoint. A few placement options show up on the backend, making it a little more complex than some of the other plugins. That’s not saying much though, since the social sharing plugins are always pretty simple. 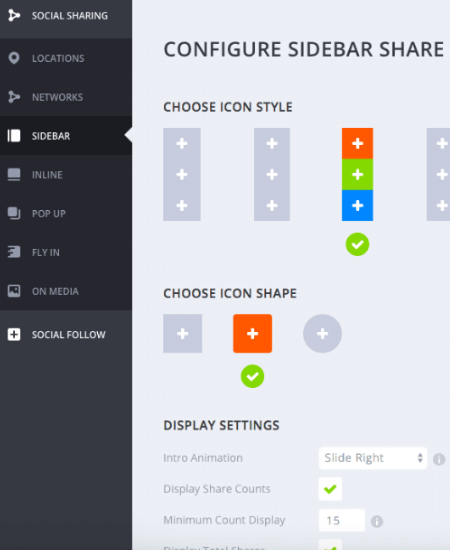 For example, you can insert some of the sharing buttons through shortcodes, widgets and floating bars. The dashboard settings also offer different color combinations for branding. Not to mention, you can place the fan count and sharing number on the buttons if you’d like. The skins aren’t anything crazy, but they get the job done. The main reason I enjoy this plugin is because it also integrates with platforms like Jigoshop and Easy Digital Downloads. Once again, the Pingdom performance grade went down with one of these plugins. 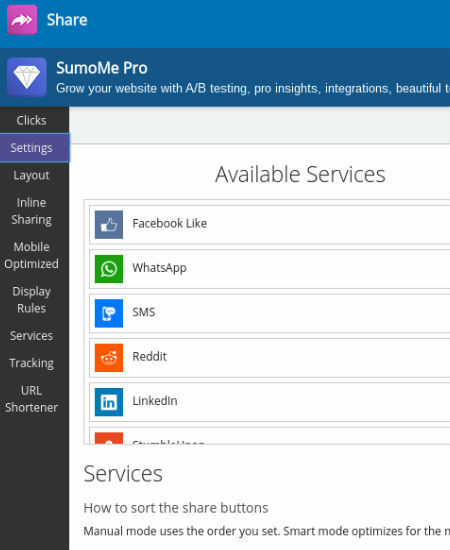 If you’ve tried out SumoMe in the past, you know that the tool provides an entire suite of options. However, we’re only looking at the social sharing buttons today. In terms of simplicity, SumoMe wins the crown. Activating the plugin only takes a minutes. But then you have to locate the Share app to activate it. I would argue that SumoMe provides the largest count of social network buttons. Some of them I’d never even heard of before. You can manage your layout, inline sharing, mobile optimization, display rules, services, tracking, and more. The dashboard even has a URL shortener for cleaning up the links that get shared from your site. The user experience rocks with SumoMe, since you constantly know that you’re in the social sharing section of WordPress, with a popup window that looks far different from the regular WordPress layout. The only problem I have is how you must activate every element individually in SumoMe. I often forget to do this, assuming that the social buttons are already revealed upon installing the plugin. Besides the increase in the GTmetrix page load time, this plugin looks pretty darn good when it comes to speed. Social Buzz delivers a decent set of features, but the backend looks a little less organized and modern than most of the other plugins. Managing the overall look and style of social buttons only takes a few minutes, and the visuals help out with seeing what you can expect on the frontend. There’s also a little tab for specifying whether or not you’d like to only show share counts after you reach a certain threshold. Some of the other settings help out with the location of your buttons and whether or not all of the featured buttons come up on every single one of your pages. The tracking pleases me the most, since all of the sharing stats are compared on the dashboard for easy consumption. However, by far the most impressive feature is the graph that shows up next to your sharing buttons. 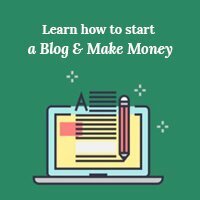 It simulates how popular an article is, pushing more shares and giving your site a unique look. The graph can be turned off if needed. 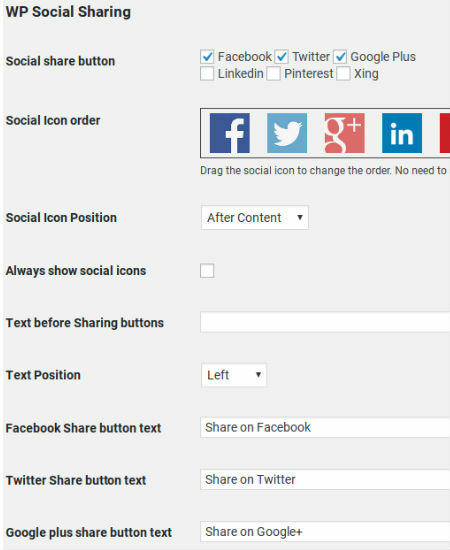 Customizing your social sharing buttons is incredible on the Fixed Social Share plugin. Each of the buttons has its own page for you to adjust settings like background coloring, hover color, icon color, the actual icon, and the icon URL. The Schema integration is a nice touch, while the custom CSS module is something you can’t find in the majority of plugins on this list. Displaying the number of shares comes in handy, and you receive a setting that sets a threshold for the number of shares needed before placing the actual number on the button. The button designs are simple, but that’s not a bad thing. You can also customizae the exact positioning of your button, with an insane amount of precision. 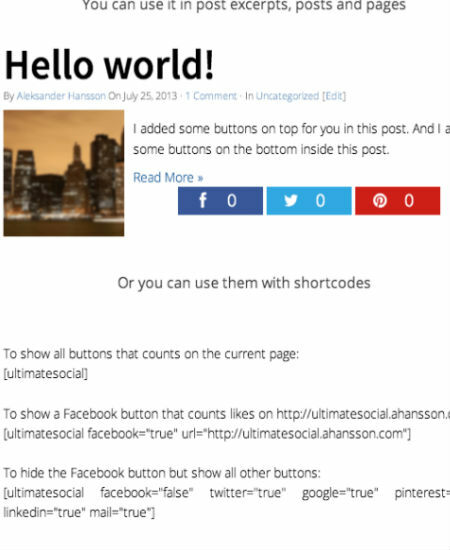 Besides the free aspect, the WP Social Sharing plugin has a certain amount of cleanliness to it. There’s no doubt that WP Social Sharing is the easiest social sharing plugin to manage. It includes just one page, with a quick list for webmasters to check off boxes and make decisions. Now, this eliminates much of the customization options you would expect from other plugins, but I like WP Social Sharing for the ultimate beginners, or developers who don’t want to think much about social buttons. Only six social media buttons are provided, so keep that in mind. The settings include options to always show social icons, adjust the positioning, add text to the buttons and move around where the text shows up. A shortcode comes along with the plugin, and you’ll rest easy knowing that each of the social buttons are mobile friendly. Finally, you can choose to place these social buttons on posts, pages or media items. It’s a solid plugin since you don’t have to pay a dime, and the settings aren’t hard to manage. Oh yea, and this plugin isn’t going to slow down your site much. The backend of the Easy Social Share plugin lets me know that the developer needs to partner with a designer and a writer. For such a simple plugin, it’s riddled with clutter and lots of text explaining how it works. Not to mention, you have to go out of your way to find your Facebook ID in order to get the app to run. It’s not the worst thing in the world, but you’d assume that a simple Facebook URL would do the trick. Other than that, you can select between five other social networks (one of them being an email sharing button). There’s not much in terms of design tools, and you can’t even see what the buttons are going to look like before you publish them on your site. However, I understand Easy Social Share is completely free, and I shouldn’t expect too much. So, if you don’t want to spend any money, and you just want the bare minimum, consider the Easy Social Share plugin. Once again, the lightweight, free plugins look solid on the speedometer. Which Social Sharing Plugin is Right for You? When going strictly based on my personal experience with the social sharing plugins, I would definitely recommend the following: SumoMe, Monarch, and Fixed Social Share. 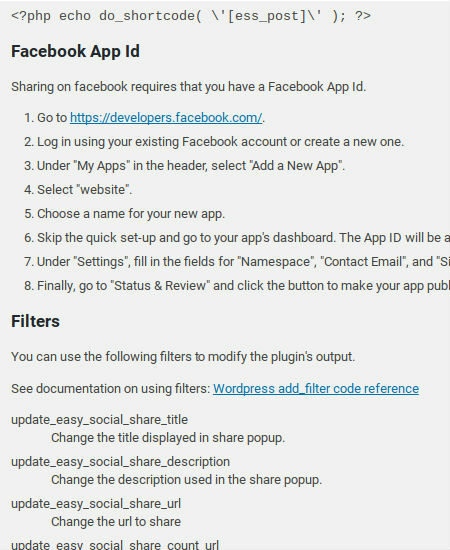 Beginners should check out WP Social Sharing, since you don’t have to pay any money, and it only consists of one page on the backend. Social Buzz struggled with speed problems, so I would put this one at the end of the list. If you’re looking for overall value based only on speed, SumoMe and Easy Social Share blow most of the other plugins out of the water. Now that we’ve had a chance to go over some of the top social sharing plugins to choose from, let us know if you have any experience with these. If you liked our comparison of top social media plugins, you may also want to take a look at our top backup plugins comparison post. Share your thoughts in the comments sections below, and feel free to ask us any questions you may have. Brenda is a professional writer and WordPress enthusiast from Huntington Beach, California. My most recent guide is: Best WordPress plugins for 2017. Thanks for the fair review Brenda! Would love to know what you think of Social Warfare since we’ve broken it off into a Free version and now the premium features being their own separate paid add-on. As far as page speed goes, our developer is obsessed with speed, so he’ll be happy to see you’ve used GTMetrix and found that it outperforms the others according to that tool. We’ll have to look into what may have happened with Pingdom tools to show it performing less optimally than in our own internal testing. Could have been a version hiccup, but we’ll investigate nonetheless! Thank you for the comprehensive review. Which social plugin do you use here on this site? It looks very attractive and also decent. I did install “WP Social Sharing” and my impression is: “very old”. Does not like it. The one we are using is custom made, just the bare-bones without any extra options or share count. Yeah, WP Social sharing does look a bit outdated. You should try Monarch plugin or Fixed Social share plugin. We are not using any plugin, it is custom coded in the theme.